From the beginning, humans sought ways to heal themselves. From prehistory to current day we are still in search of cures using old and new methods. Early healers were often referred to as magicians, medicine men, or shamans. The ancient Egyptians had a system of medicine that was very advanced for its time and influenced later medical traditions. 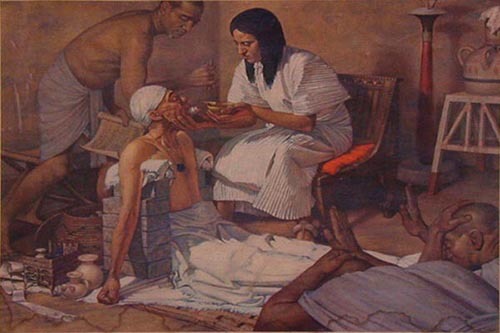 The Egyptians and Babylonians both introduced the concepts of diagnosis, prognosis, and medical examination. They provided modern historians with a great deal of knowledge and evidence about their attitude towards medicine and the medical knowledge that they had. This evidence has come from the numerous papyruses found in archaeological searches. Like prehistoric man, some of the beliefs of the Egyptians were based on myths and legend. However, their knowledge was also based on an increasing knowledge of the human anatomy and plain commonsense. Healers became known as physicians or doctors. The Ancient Romans, like the Ancient Greeks and Ancient Egyptians, made a huge input into medicine and health, though their input was mainly concerned with public health schemes. Though the Roman discoveries may not have been in the field of pure medicine, poor hygiene by people was a constant source of disease, so any improvement in public health was to have a major impact on society. The Romans learned a great deal from the Ancient Greeks. They first came into contact with the Greeks in about 500 BC By 146 B.C. part of Greece had become a province of the Roman Empire and by 27 B.C., the Romans were in control not only of Greece but of Greek-speaking lands around the Mediterranean. They used the ideas of the Greeks but they did not simply copy them. Greek ideas they found impractical they ignored and it seems that the Romans were more keen on things that would lead to the direct improvement of the quality of life of the people in their huge empire. The Greeks went even further, and advanced as well medical ethics. 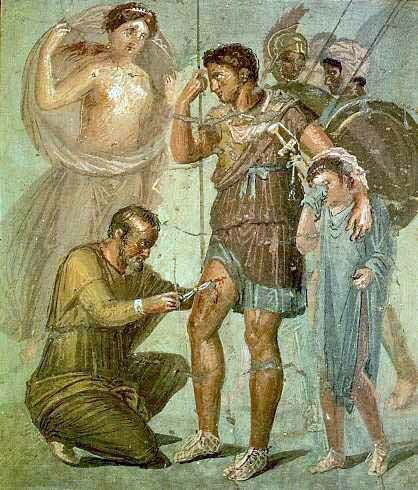 The Greeks practiced medicine 1000 years before the birth of Christ. 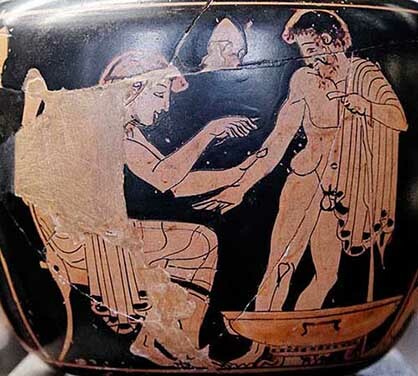 In the ÔIliadÕ by Homer, injured soldiers were treated by doctors and the Greek leader in the tale, Menelaus, was treated for an arrow wound by a doctor-in-arms, Machaon. The Hippocratic Oath, still taken by doctors up to today, was written in Greece in the 5th century BCE. In the medieval era, surgical practices inherited from the ancient masters were improved and then systematized in Rogerius' The Practice of Surgery. The germ theory of disease in the 19th century led to cures for many infectious diseases. Military doctors advanced the methods of trauma treatment and surgery. Public health measures were developed especially in the 19th century as the rapid growth of cities required systematic sanitary measures. Advanced research centers opened in the early 20th century, often connected with major hospitals. The mid-20th century was characterized by new biological treatments, such as antibiotics. These advancements, along with developments in chemistry, genetics, and lab technology (such as the x-ray) led to modern medicine. Medicine was heavily professionalized in the 20th century, and new careers opened to women as nurses (from the 1870s) and as physicians (especially after 1970). The hepatitis B virus has many mutations that no longer exist Ð and the information could help us prepare for dangerous new strains, scientists said. The discovery was made by carrying out DNA sampling on a Bronze Age skeleton in Osterhofen, Germany, as part of a wider study of 300 skeletons from central and western Eurasia, which are between 200 and 7,000 years old. The hepatitis B skeleton belonged to the ÔBell BeakerÕ culture, so called because of the bell-shaped pottery cups left behind. Genetic variations associated with some modern maladies are extremely old, scientists have discovered, predating the evolution of Neanderthals, Denisovans (another ancient hominin) and contemporary humans. Psoriasis, a chronic skin condition, can cause rashes that itch and sting. So why would a genetic susceptibility to this and other ailments persist for hundreds of thousands of years, afflicting our ancient ancestors, and us? That's the question scientists are asking after discovering that genetic variations associated with some modern maladies are extremely old, predating the evolution of Neanderthals, Denisovans (another ancient hominin) and contemporary humans. It's often said that there was no tradition of scientific medicine in medieval times. According to the usual narrative of the history of progress, medicine in the European Middle Ages - from around the 5th to the 15th centuries - was a formless mass of superstition and folk remedies; the very antithesis of science. And those who look in medieval medicine for precursors of modern pathology, surgery, antibiotics, or genetics will of course find it a failure. But if we're looking for a coherent medical system that was intellectually and emotionally satisfying to its practitioners and patients, and based on written authorities, rational enquiry, and formal teaching, then medieval Europe produced one of the most influential and scientific medical systems in history. Medieval medicine did take many forms. Some of it was non-literate and based on inherited traditions, some on the use of simple herbs, while other remedies were based on blaming elves or demons or sin for sickness. Sometimes it was practiced by women for their families and servants. An international team of researchers has provided the first molecular evidence that Neanderthals not only ate a range of cooked plant foods, but also understood its nutritional and medicinal qualities. Until recently Neanderthals, who disappeared between 30,000 and 24,000 years ago, were thought to be predominantly meat-eaters. However, evidence of dietary breadth is growing as more sophisticated analyses are undertaken. Surgeons were carrying out complicated skull operations in medieval times, the remains of a body found at an archaeological dig show. A skull belonging to a 40-year-old peasant man, who lived between 960 and 1100AD, is the firmest evidence yet of cranial surgery, say its discoverers. The remains, found in Yorkshire, show the man survived an otherwise fatal blow to the head thanks to surgery. Nearly 700 skeletons were unearthed by English Heritage at a site near Malton. Ancient humans recognized that sometimes a hole in the head was exactly what was needed. Skulls with holes bored in them have been found by archaeologists in virtually every region of the world, and scientists have debated for more than a century about the motivation for the holes. Are they evidence of an emerging medical technology or an artifact of practices involving magic, ritual, warfare, or religion? 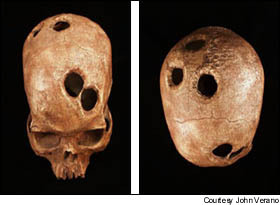 "Good evidence exists to show that trepanation was performed as a treatment for skull fractures," says John Verano, a physical and forensic anthropologist at Tulane University in New Orleans, in the September 16 issue of the journal New Scientist. Verano, who specializes in the prehistoric cultures of the Andes, has compiled a data base documenting the physical characteristics of nearly 700 trepanated skulls from Peru and Bolivia. Evidence of trepanation - deliberately cutting or drilling a hole in the skull - dates back to 3000 BC, and possibly as far back as 10,000 years ago. Trepanation is discussed in medical texts of ancient Greece; Hippocrates (c. 460 to 355 BC) wrote extensively about when, why and how to perform trepanations. Until the mid-1800s, though, the received wisdom among archaeologists and anthropologists held that prehistoric trepanations were performed only after death. Scientists attributed the holes to burial rituals or war practices, parading the head of an enemy on a stick or hanging it by a string. Among some early cultures, pieces of bone were carved from the skulls of the fallen mighty and worn as amulets. In the 1860s, anthropologist Paul Broca recognized signs of healed bone surrounding a hole in a prehistoric skull. This convinced him that surgery had been performed on the living. As old evidence was reviewed and new evidence found, the idea that prehistoric humans practiced trepanation became widely accepted. While evidence of trepanning has been found around the world, the most skulls - about 1,000 - have turned up in South America. Verano's data base includes skulls from Peru and Bolivia spanning nearly 2,000 years, from 400 BC to 1500 AD. These were violent times for the peoples of the Andes. The weapons of choice were slingshots and clubs, and skull fractures were a fact of life. Among skulls found in the central highlands region of the Andes dating from 900 to 1500 AD, more than half the men had at least one skull fracture, as did 32 percent of the women and 27 percent of the children, according to the New Scientist report. "There was probably a lot of village warfare in which everyone got involved," says Verano. Verano's data shows not only that trepanned skulls were highly associated with skull fractures but also that surgical techniques improved over time. "The holes got smaller over time," he says. "The earliest were quite large; 4 inches by 4 inches, (10 centimeters by 10 centimeters) or even larger, while some of the later ones are no larger than a single drill hole. It looks like they figured out that they didn't have to take quite so much bone. " With improved techniques, survival rates also improved. 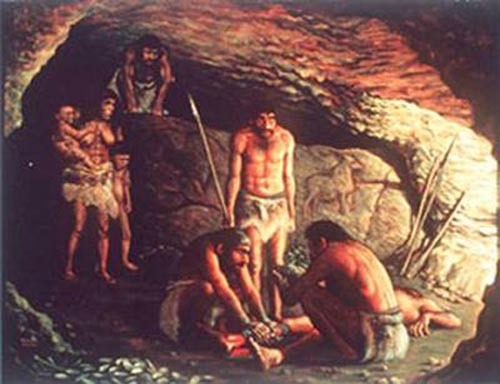 Surgeons on the southern coast of Peru around 400 BC scraped away the bone around a head wound with stone tools, and had a survival rate of about 40 percent. By 1350 AD, Inca surgeons in the central Andes had developed a range of techniques for performing the surgery - and appear to have had a survival rate of more than 80 percent. Anthropologists can tell whether a patient survived the surgery because, given time, the rim around the hole becomes smooth. The improved success rate, the development of several techniques for performing the surgery, and evidence that surgeons made choices about which technique to use, combine to show that the surgery was part of an emerging medical repertoire, says Verano.